In a major initiative to both celebrate its history and revitalize its city, Santa Fe Springs launched the Heritage Springs Redevelopment Project. Griffith Company was contracted to build the project’s showpiece: the Heritage Springs bridge. 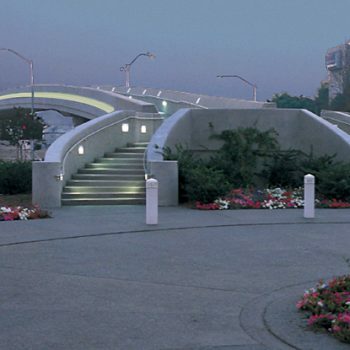 In addition to providing elevated pedestrian access to restaurants and shops, the bridge would also serve as a symbolic link between the city’s past and future. The project encompassed significant challenges, including the diagonal direction of the bridge that crossed over a busy intersection traveled by 53,000 cars a day. Constructing the intersection in six phases to minimize traffic flow interruptions, our crews replaced the entire intersection with PCC paving then spanned the roadway using a falsework bent right in the center. The work was completed without a single traffic accident or injury. While installing utilities and initiating work in the footings, our crews encountered, removed and capped four abandoned oil wells, losing three months of valuable construction time in relocation and soil remediation. Our crews worked around a myriad of existing oil lines, again without a single incident. Bridge construction required the building of a 450-foot pass-through pre-stressed structure on CIDH piling, extensive formwork and a single 670-cubic yard monolithic pour of the bridge and railing. Remaining sensitive to the bridge’s high visibility and symbolic importance, our crews built a very attractive structure. Arched and horizontally curved, the structure includes intricate recessed lighting and expansive, custom-formed curved stairways. 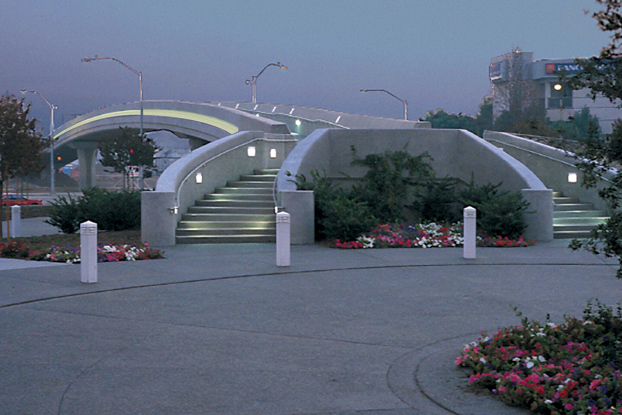 The stairs spill into a beautifully landscaped turnaround entry paved with colored concrete seeded with Mexican pebbles. Despite unavoidable delays and complications, Griffith Company leveraged our partnering and project management capabilities to meet the accelerated schedule and opening day. We completed a seven-month job in only four, and were selected as a finalist for the prestigious Constructor Award for Excellence on Project Management.